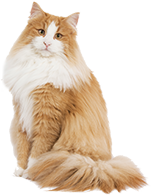 Feed as a snack or treat in conjunction with your cat’s regular diet. For the best dental benefit, feed FELINE GREENIES™ FLAVOR FUSION™ Dental Treats daily. As with any treat, always adjust the amount of main meal to compensate for calories delivered by treats.